Voted by many best dive location in mainland Costa Rica, Caño Island is home to an amazing variety of marine life. This area is a protected marine park. Fishing is prohibited for 3 miles around the island and the collecting of shells and harvesting of other marine life is also prohibited. 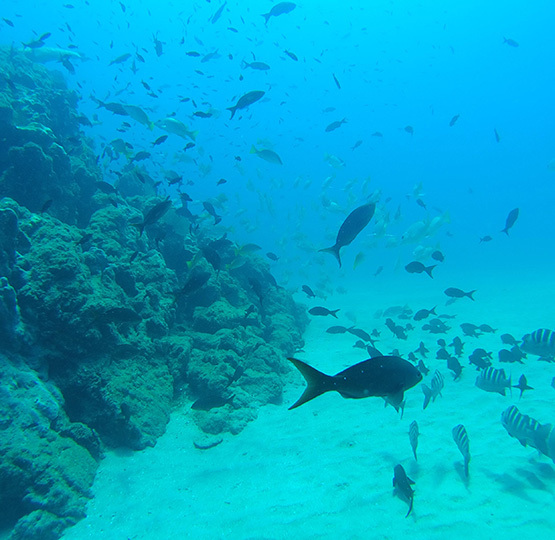 You will encounter both pelagic (open ocean) and reef fish. If you like to see large schools of jacks and barracudas, sting rays and manta rays, and if you like sharks, you will enjoy your dives here. Dive sites range from 10 meters (30 feet) to 40 meters (120 feet), and current ranges from mild to fairly strong. For a description of the most popular locations please see Pirate Cove Hotel's recommended diving sites. We leave Drake Bay each morning at 7:00 a.m. The island lies about 15 kilometers offshore and our trip takes about 50 minutes. The island is just far enough off the shore to keep the seasonal rains from affecting the visibility in the diving site, which makes it a great diving site. Upon arrival we check in at the island before our first dive. We then return to the island for our surface interval. Then will do our second dive and return to Drake Bay at around 1:30 p. m. We will have lunch in Hotel Pirate Cove. Dear visitors of Caño Island, with consideration to the information given by the Health Ministery and Osa Conservation Area, we are now permitted to land on Caño Island Biological Reseve for resting, but we are not allowed to walk in the trails. The island doesn't offer bathrooms or picnic areas, so we will do the first dive at the Island then we will land on the island for a break, next we will do the second dive. Voted by many best dive location in mainland Costa Rica, Caño Island is home to an amazing variety of marine life. This area is a protected marine park.